A glance at the library bookshelves reveals a dozen books written about German Maestro Wilhelm Furtwängler over the last decade to coincide with the 100th anniversary of his birth and the fortieth anniversary of his death. The current obsession with the role of art and culture in the Third Reich has also focussed attention on Furtwängler, who was Hitler's favourite conductor. Last summer I had the good fortune to interview Wilhelm Furtwängler's step-daughter Kathrin during her visit to Montreal. Kathrin was a little girl when her mother Elizabeth married the great Maestro. She was glad to talk about the growing public fascination with Furtwängler and to share her memories of their family life in Germany and Switzerland during the last decade of Furtwängler's life. Wilhelm Furtwängler was born on January 25, 1886, in Berlin, the oldest of four children and the only one to become a musician. His father Adolf was a well-known classical archaeologist and his mother Adelheid was a painter. The boy's musical talents were evident early: he started piano lessons at age 4 and penned his first composition at age 7. Furtwängler's earliest ambition was to become a composer. He started conducting just to earn a living. He never played in an orchestra, but learned the ropes as a rehearsal pianist. His father helped arrange a concert for him in 1907 - Bruckner's Ninth Symphony with Munich's Kaim Orchestra - which was his first big success. A 1912 concert conducted by the great Artur Nikisch in Hamburg stimulated Furtwängler's ambition to become the best conductor of his generation. He soon became known and attracted a loyal following. An engagement with the Mannheim orchestra led to his appointment as director of the Berlin Philharmonic. Through the 1920s and 30s Furtwängler was considered the foremost conductor of his time and it is interesting to learn that even his children were in awe of him. "Looking back I can say he is the greatest person I've ever met. We all knew that, even as children," recalls his step-daughter. Wilhelm was a good father, loved to laugh and tell jokes to his children. "The thing I remember best is that when he played with us he played to win. Some grown ups, when they play with children let them win, but my father's way was much more fun." Another anecdote reveals Furtwängler's legendary competitiveness. One morning her father described a terrible nightmare he had: "I dreamed I was in a race and I came in second." Furtwängler's work ethic was strong. "Goethe said that genius is 99% perspiration and 1% inspiration, which certainly applies to my father. He had great powers of concentration. He could sit and memorize a score without being bothered by all the children making noise around him." She recalls how he went for a walk every day, following the same circuit for hours. "He didn't look at nature. He was probably still thinking about work." Kathrin also recalls spending her school vacation in Salzburg where her step-father was conducting Verdi's Otello. "They rehearsed a lot more than they do today. We stood the whole day in the rehearsals and I cried every time Otello entered Desdemona's room to kill her." She also recalls that at first he didn't want to do Otello but after it was over he decided it was a good opera. "He could always find something valuable in the music." Furtwängler's fame reached its height during the Nazi years. His work brought him into close personal contact with high Nazi party officials, including Goebbels, Göring and Hitler. The notorious film footage of Furtwängler shaking Hitler's hand after a concert has done his reputation great harm. Kathrin tells the story of that event: "That Nuremberg concert was supposed to be on Hitler's birthday, so my father scheduled it the day before, thinking Hitler would not attend. He was so furious when Hitler came to the concert that he pulled a radiator off the wall. 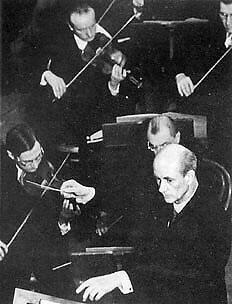 Furtwängler came on the stage and told his musicians to begin right away. But after the concert, Hitler gave him his hand and he had to shake it. If you don't know the story, then it is easy to get the wrong idea from the photo." Furtwängler was never a Nazi party member, but he enjoyed official favour, honours, and earned more money than any other German musician of his day. Endless books and articles have been written about Furtwängler's involvement in the musical life of the Third Reich. Katrin describes Wilhelm as a political innocent who thought he could do good by staying in Germany. "He stayed in Germany to give the people the gift of his music. He was very German, his roots were there and he would have suffered in exile. What was important for him was German culture. No other conductor knew more about German literature and painting. It was not just the music, he wanted the whole culture around him." Whether Furtwängler was a Nazi is still hotly debated. Michael Kater in his book The Twisted Muse: Musicians and Their Music in the Third Reich (Oxford University Press, 1997 p.201) claims that he was, while (as other writers before him) offering examples of people who were helped by Furtwängler. In any case, Furtwängler was used by the Nazis and used them in return. He was denazified in 1947, and the transcripts have become the basis for Ronald Harwood's play "Taking Sides," which makes its Canadian debut at Montreal's Centaur Theatre in February 1998. Furtwängler's final years were unhappy. In 1952, a course of the antibiotic streptomycin damaged the nerves in his ears, leaving him deaf. Attempts to compensate for his hearing loss with onstage loudspeakers were ineffective. In 1954 he conducted his last concert and died after another bout of pneumonia. Considering how her father dreaded growing old (he always avoided the local old folks' home) Kathrin considers his death an act of mercy. "He certainly didn't want to become a useless old man." Furtwängler's conducting style can be studied on several commercially available videos (including Teldec's "The Art of Conducting" series and the Bel Canto Society's "Great Conductors of the Third Reich"). He leads his orchestras with a magisterial intensity, with expressive hand movements but a strangely stiff back. His daughter explains that this was not a case of nervousness, "My father was the most relaxed person I've ever seen. People always remarked on the elegance of his conducting, especially his graceful turning, but this was partly the result of a skiing accident. He hurt his neck, so he couldn't turn his head alone. " Furtwängler made relatively few recordings in his lifetime, mostly for EMI, but a wealth of excellent pirate recordings exist from live broadcasts of the 1930s and the post war era (a comprehensive discography is available on the internet at the Website http://www.fornax.hu/wfsh/disco.html ). He left behind several compositions which he asked his wife not to promote, hoping they would be appreciated on their own merits. 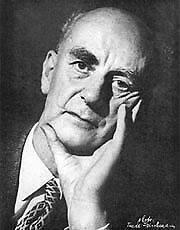 He wrote several essays on music and conducting. In a letter to La Scena Musicale Furtwängler's widow Elisabeth (the English translation of her biography of her husband was published last year by the Furtwängler Society) declares herself pleased by the growing interest in her late husband's music and writings "not only among younger people who know him only from records, but also among the younger generation of conductors who are emulating his example in their own work, especially Sir Simon Rattle, Esa Pekka-Salonen and Christian Thielemann. It might not be too much to say that Furtwängler is becoming better understood now than in his own lifetime. There is a splendid irony in that." Taking Sides opens at the Centaur Theatre in Montreal on February 24. Info: (514)288-3161. In a future issue, we will look at the music of Furtwängler.